Prototype: Class 185 dual system general-purpose locomotive and class 2016 "Hercules" diesel electric general-purpose locomotive. 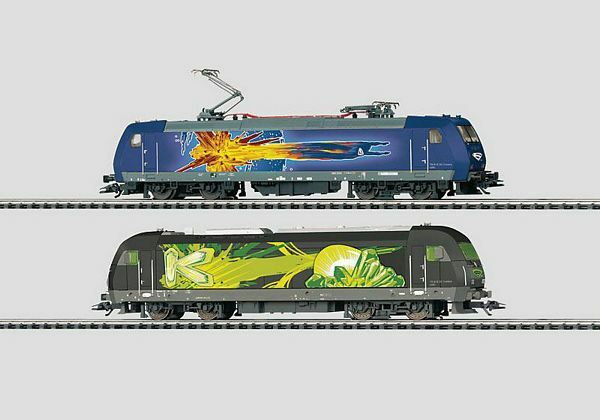 Both locomotives are designed with themes from the world of "Superman". Model: The Superman locomotive set contains a Superman electric locomotive and a Lex Luthor diesel locomotive. Both units are constructed of metal. Each locomotive has a digital decoder and a special can motor. Each locomotive has 4 axles powered through cardan shafts. Each locomotive has 2 traction tires. The headlights are maintenance-free LED's that will work in conventional operation and that can be controlled digitally. The acceleration and braking delay can be controlled with the 6021 Control Unit or with Marklin Systems. The electric locomotive comes with 2 pantographs that can be raised and lowered manually (they are not wired to take power from the catenary). Length over the buffers for each locomotive 21.7 cm / 8-9/16. Locomotives with metal bodies. Decoder for all modes of operation. Correct paint schemes reflecting the characteristics of the two fighters in Metropolis. One-time series only for Marklin Insider or 1. Fanclub Marklin members. On August 17, 2006 the new film Superman Returns appeared in Germany in theaters. What makes the movie so special from a Marklin point of view is the large Marklin layout, 14 by 14 meters / 46 feet x 46 feet, which covers one of the central themes of the movie. The struggle between Superman and Lex Luther also takes place in miniature on the layout. The remarkable thing is that the layout was built in two scales - H0 and 1 Gauge. This made it possible to have all kinds of film perspectives. All sorts of different trains run on 280 meters / 918 feet of track in both gauges and with 21 power circuits. This item is only available in Europe (except for Great Britain). A car to go with these locomotives is the 1. FC Marklin annual car (item no. 48706) - the transporter for green Kryptonite, which lights up secretly when used on the layout.